So Dwelvers v0.11.18 has now been released on the website and on Steam! This new version has filled some gaps in the old UI, I've mentioned earlier that I got some suggestions on remaking the resource bar in the top of the window that showed some of the items in the game. I thought these suggestions were really good because one issue with the old UI was that it was tedious for the player to get information about how many units of a item type they owned. Usually it required the player to go into the items menu and search for the item type, and this is something I really wanted to avoid. I want the player to have all the information they need right in front of them so that they can make quick decisions without having to click around, and the old items menu counteracted that purpose. So since the last update I've been working on getting rid of the items menu and making its options available in a new improved resource bar instead. As you can see in the screenshot below the whole resource bar has been changed! Instead of just showing a part of the total amount of item types in the game I've categorized the items so that the player now can click on a category and then find the item type he or she wants information on. Basic items - Lists items that can be found naturally in the dungeon and don't need to be crafted in a production chain. 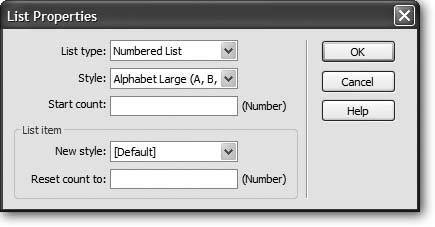 Advanced items - Lists items that can only be produced by combining other items in a production chain. Consumables - Lists items that can be consumed by creatures. 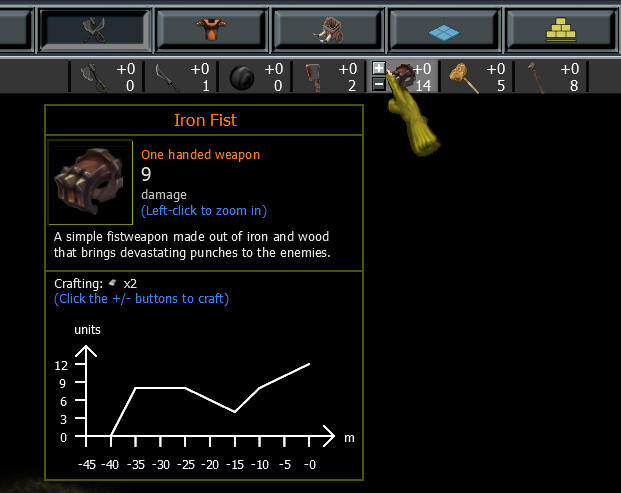 Weapons - Lists equipable weapons and other items that can be crafted and used for inflicting damage on enemies. Armors - Lists equipable armors and other items that can be crafted and used for defending against enemy attacks. Trades - Lists available trades that can be made in exchange of gold. Rooms - Lists owned rooms. Floor constructions - Lists owned floor constructions. Wall constructions - Lists owned wall constructions. Hydraulics - Lists owned hydraulics. Fluid related buildings - Lists building that can be built on different types of fluids. When choosing a item related category you will get a sub menu showing the items that fits the category. As shown in the screenshot below you can see the amount of items owned by the player and by hovering an item type you will get more detailed information about that item type. Also, by left clicking on the item type the camera will zoom in on the items belonging to that type one by one, this is a great way to locate items that there are a shortage of and make sure they get delivered to the right place. When choosing an item related category with item types that are craftable the sub menu will look a little bit different. As seen in the screenshot below you now have the amount of items owned in the bottom right corner in each item type sub menu, and above that the amount of items that are queued for crafting. When hovering the craftable item type a 'plus' and a 'minus' button will appear, and by clicking these you will add or remove crafting queues. This is the biggest feature upgrade for the game mechanics, we now have new way to trade items. When I started working on the resource bar I had the intention to replace the whole items menu, but I didn't know exactly what to do with the trading system. It was way to complex to just add into the resource bar. I've also been thinking for some time that I wanted to simplify it a bit because usually players tend to ignore it when playing the game. The reason for this may be because it was way to complex and hidden away in the items menu. Trades are no longer fixed for each portal, you can now make all types of trades with all portals. The trading option you will get by claiming a portal is no longer yours to make, instead the trades that gets unlocked are fixed in a random order that is decided when starting a new game. Items are no longer traded with items. Instead we use gold as a currency. You no longer add or remove trades by hand. Instead you set conditions for when to buy a certain item and when to sell a certain item. You can now for example buy bread for gold or buy gold for bread, but you will always make a loss when selling items. In this scenario you can get 6 bread for one gold, but to buy one gold you need to sell 12 bread. 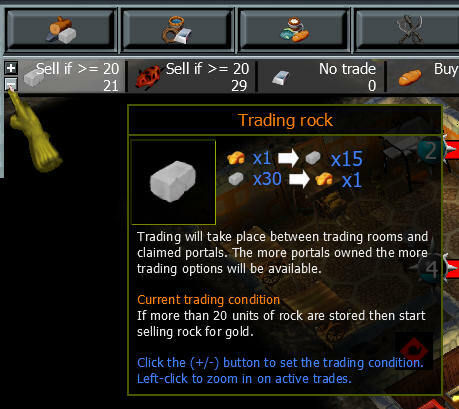 In another example you can sell 30 rocks for one gold, and then buy 6 bread for one gold. In this way we can get rid of the huge amounts of rocks and other items the player tend to collect when playing the game for too long. 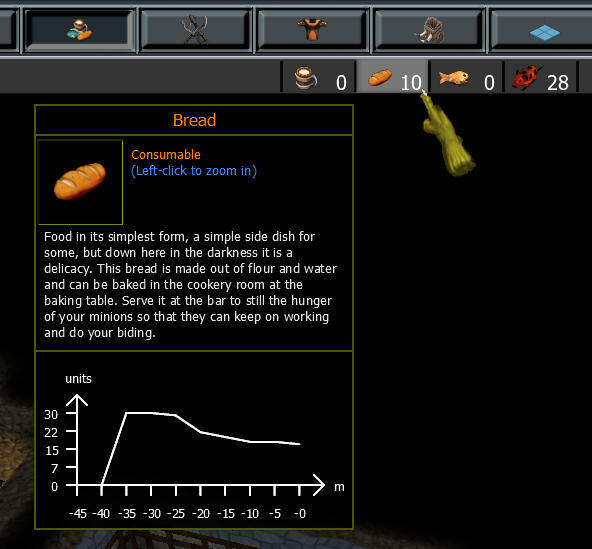 So by looking at the screenshot below you can see how the new trading system are implemented into the resource bar. 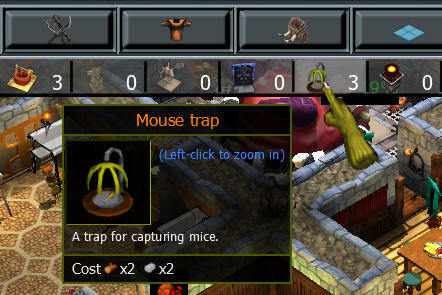 By hovering a trade with the mouse and by clicking on the plus or minus button you set the trading condition for that specific item type. By clicking the plus button you set a value for when to start buying this item type. So if the value is 30, then you will start buying this item type when you have less than 30 units of this item type stored in the dungeon. By clicking the minus button you set a value for when to start selling this item type. So if the value is 30, then you will start selling this item type when you have more than 30 units of this item type stored in the dungeon. In this way you don't have to micromanage the trading. When choosing a building type related category such as rooms, wall construction or hydraulics the sub menu will show the building types matching the category. Besides from just showing the amount of buildings of a certain type owned by the player, the player can now also get detailed information of each building type by hovering the sub menu. And by left clicking a building type the camera will zoom in on the buildings belonging to that type one by one. I also made some promises to add an extra button to the resource bar where the player can setup his own items, so that the player only sees the items that are of interest for him or her. But I decided to put this option on hold for now so that we can see how this new resource bar plays out first. Dwelvers Alpha v0.11.18 is available for download at the Dwelvers Website and on Steam. Yeah I think with the way you have the resource bars categorized, a custom bar wouldn't really be necessary. I'm interested to see how this improves the UI since the resource bar was kind of a pain to deal with on each new game; sorting and resorting....With my year-end projects coming to an end, I should have some time to really give it a go, and do some digging for bugs again; although I think they've been reduced significantly. Well Mello, if you didn't start The Resource Bar topic who knows, maybe we would still use the old resource bar. I really like how you made it Rasmus, mixed ideas into one bar, great job. P.S. You know I'm not fan of money, but in these times and when you have a surplus of resources, want to clean up your storages that's a good idea to do it, but of course now you can have almost any item for gold... also I wonder if we still need to dig gold that was so rare to find before? And you are right, if Mello didn't start the topic, then this feature would probably not be included. That's true, gold was just the one of many other resources, but just a little rarer for no reason, now it got the reason. Features to be implemented hmm, maybe you would like to check some ideas made since November in Suggestions & Feedback forum? Making a bigger distinction on what creatures are player creatures and human creatures. New way to produce creatures, I think the player has way to little control over the creature production at this time. Fix the creature equipment menu. I think I will stay with just having body + left hand + right hand equipable, the current system that we have first, second and third prio equipment is ok by me. But what needs to change is the UI part on how the player control what equipment each creature should have. Personally I think we can get rid of the single creature equipment option as I don't think this one is used that much and just keep with the creature type equipment. Creating a Cyclotaur room (based on the cyclotaur maze graphics). Give room menus a new design. Move all localizations to one xml file so that it will be easier for future translations in the game. These are not set in stone. But as I find these tasks to be the most urgent and must have before the level editor I will focus on these. Hollly Cyclocow. When you said in last post wins that "perhaps I should have been more informative here on the forums" than now I think you really could. That's a lot to think about. I agree about leaving the option to give equipment to all creatures in certain group. I wonder only - if there was one or two pieces of legendary armour somewhere (like I could find i.e. in campaign mode) and would like to give it to my favourite creature or two than I could just order it to go to storage room, than check to give that armour to creature type in which belongs my favourite creature or two, so game will choose them to wear that armour because they're the closest to that storage room? Or game is choosing randomly who will get new armour first? Hmm you said that creature-specific equipping is not used that much, but why couldn't it just stay there? I rarely use this option, true, however when I have only few very good weapons or bone armours I rather want to give them to the strongest or those who are most healthy. the highest equipping priority would have creatures from squad number 1 and to them would go for example Bone Armours, than if creatures from squad 1 doesn't have any more room for that armour than Bone Armours goes to creatures in squads number 3, number 5 than to Impanzees, than the strongest that aren't assigned to those squads or are Impanzees. So if we would like to equip only 3 different and good creatures with certain weapon (or that legendary armour ) we could just add them to one squad by just simply going to resource bar, clicking on certain weapon or armour, than on it's equipping priority list and make some moves on that priority list. So what you are saying is that we just make a list of what creatures get the first pick of all weapons and equipments? Sorry, I'm just trying to find errors in your idea Actually it's the best idea so far Let me think a bit about it, it's simple enough for the player to use and be presented with no more than a list. Heh, that was the simplest thing I came to make it possible to equip creatures I would like to equip first. That's why such "priority list" would IMO make chosen squads or creature types getting armour I want them to equip first, than if I want to equip other creatures with the same armour I would just need to make them more, but I understand the flaws you mentioned. than if player won't choose nothing more creature groups than game will give Bone Armours to creatures that weren't choose on any list by random. This way player will be able to set euipping priority to random just by setting all to "-" or default again. You set weapons and armours priority right now to let them take first armour from first slot in creature menu, than if there is no items left in storage than they equip items from second slot and than from third. I think if we switch some priority lists for Bone Armour than creatures that aren't choose from priority list will have to turn back the Bone Armours (only if there are no Bone Armours left of course, otherwise they keep the Bone Armour), what do you think? Sebt, I like your idea's very much, from what i have read here, But i honestly think instead of trying to reform the game, Let the game mature, I can see the benefit of having auto things happen in game like how your people go to eat food for example, you don't control that but it could be a mini game that would make life hard as hell to do. But having the way things are given to creatures i quite like as i get to choose what creatures get what equipment, Its not a well known feature to say new people as people would have to discover this option but once you do its just a matter of getting players to understand how the UI works with the game. Would you like creatures to run around with no weapon till that weapon had been made then an a weapon be assigned to a creature in your pack, Would the game play better or worse ?. Anyways. Always love ideas for this game but I like what Rasmus has on his list of things to do, I think once he can get those done the game would be more complete, However i see each game in Dwelvers a game with in it self. But that's just how i like to play the game. The idea is still about to auto-equip weapons and armours, but rather to specific group of creatures not to random ones. Currently if there is no more certain type of weapon in the storage that is assigned to creature's 1st slot, than that creature go for a weapon from 2nd slot, than if there's no weapon assigned to creature's 2nd slot it take a weapon assigned to it's 3rd slot. If we would implement priority-list equip system it would still follow this rule, it won't interrupt with it. My idea was just to set who will get what weapon first, not to make them available only for chosen groups. Let's say you made that Bone Armour need to go for Fishmen and Orcs and you set Bone Armour on their 1st slot for all Orcs and Fishmen. Than you go to Bone Armour priority list and choose Orcs, so Orcs will be the first to get Bone Armours, than if you choose nothing beside Orcs than the rest Bone Armours will be randomly assigned to other than Orcs creatures - so in this case Fishmen. If there's lack of Bone Armours than you need to make more of them otherwise creatures will take a piece of armour that's assigned to their 2nd slot, they won't "run around with no weapon" so. I think too much micromanagement may kill the game, but what else to do if I really want to make some creatures more unique, make a squad of death by equipping them specific type of armour or weapon, so this way I could send less creatures, but stronger and left others to keep my production chain going? You also don't need to use all possible features in the game, however having heavily equipped and specialized squads may decide whether you win or lose, it would give so much different approaches to win the game. We discussed long time ago even about weapons that would suit more or less specific type of creature, so for example Orc would get some small bonus wielding an axe (and I'm not quite sure if that's already implemented?). Anyway it's just about to make equipping more unique and specialized than just to have tiers of weapons, but I don't know what will we finally have in Dwelvers, currently game have implemented some features, but there are many placeholders too early, but that's understandable - it's too early to decide how to balance them, it's something for later stage of development. I've been spending some time these two weeks hunting memory leaks and fixing bugs. The memory management in the game has also been improved which may give some of you a performance boost. My hope is that this version will take care of the unexplained crashes that has happened to some of you. I've also taken some safety measures just in case the crashes hasn't been solved. This is by adding a proper error handler that will generate a crash dump file and send it to Dwelvers server so that I can locate and fix the most critical bugs asap. The sandbox seed is the same each time a new game started. And a lot of memory leaks has also been fixed. Now I've reached the point where I will focus only on the level editor, and hopefully we will see the first campaign level within a week or two I know there may be other stuff in the game that needs more polish, but I feel like we need to move forward and introducing a campaign is something that definitely will take this game to the next step! Dwelvers v0.11.19.2 hotfix is now released! The new crash handler worked perfectly, I've already got two crash dumps uploaded to me. One where it crashed shortly after pressing "Start Game" and the loading screen comes up. This is now fixed with the new uploaded version! Another one when loading a PNG file that should exist... So I couldn't solve this issue right away but I added some extra error handling around it to be able to locate the issue next time it comes up. Current time: 23-04-2019, 10:44 AM Powered By MyBB, © 2002-2019 MyBB Group.